Combine the olive oil, BBQ Sauce, vinegar, Dijon, chili powder, onion, garlic cloves, dried thyme, and chicken broth in a bowl. Place the shoulder roast in a slow cooker. Cover the roast with the BBQ Sauce mixture. Cover and cook on high for 5-1/2 hours. Remove the pork from the slow cooker. Gather a plate and 2 clean forks. Use the forks to shred the tender pork and separate and discard pieces of fat. 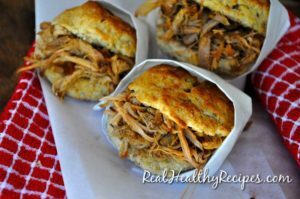 Assemble sandwiches with shredded pork and BBQ Sauce. Enjoy! Previous StoryCreate The “Mother F….” You Ultimately Want To Become!